"We crammed an entire lifetime of love into that one week that we had with her." 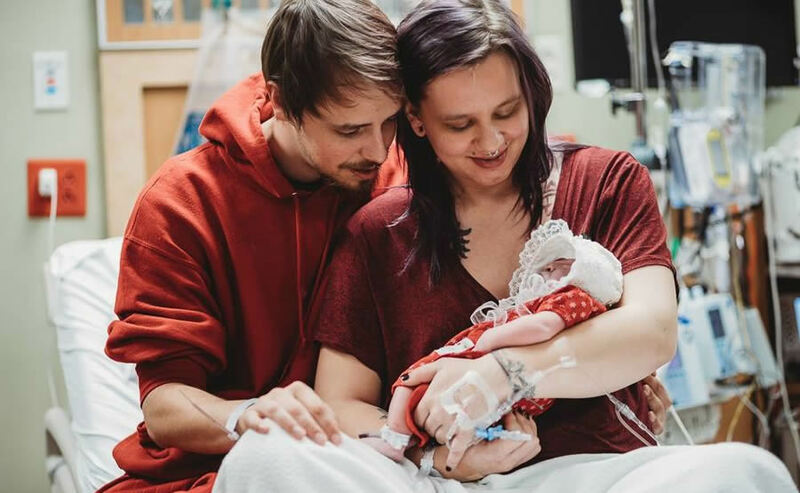 “It’s like we’re keeping her memory alive through talking about her, sharing her story with other people.” Krysta Davis talked to The Stream about her daughter, Rylei, who lived one week after birth. Doctors diagnosed Rylei with anencephaly when her mom was 18 weeks pregnant. It is a fatal diagnosis. Babies who have the defect don’t have part of their brain or skull. Most babies with anencephaly don’t survive past birth. At most, doctors told Krysta, she’d have 30 minutes to hold her precious baby after she was born. A high-risk OB/GYN gave Krysta and Rylei’s dad, Derek, two options. Krysta could choose to induce and have the baby then or carry her to term. It wasn’t much of a choice. In any event, their baby would not survive. Krysta and Derek got a second opinion. They were given the same diagnosis, but this time they were told if Krysta carried Rylei to term she’d be able to donate the baby’s organs. “We kind of just looked at each other,” said Krysta. “We were like, you know, this is what we’re going to do. Rylei was a sweet baby. She didn’t cry at all until her last day. As her oxygen levels began to drop, she let out a little cry. “It was like she was fighting to give us more time in the end.” Then she was gone.